A recently established agreement between JMP Australia and Apollo VTS (Netherlands) that will allow JMP to offer a wide range of spiral conveyor solutions to Australian and New Zealand markets. Apollo VTS (Vertical Transport Systems) manufactures high quality conveyors including spiral conveyors, spiral curves, mono-rail systems, bucket elevators, vertical accumulation buffers and product twisters. 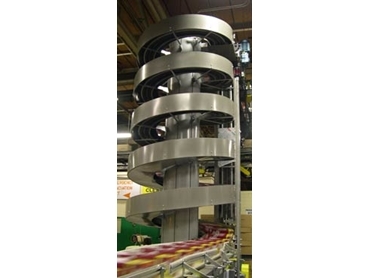 Spiral conveyors are a proven and reliable solution for vertical transport of packed products. Heavy duty spiral conveyors are offered in painted carbon steel, stainless steel or wash down versions that are suitable for the food industry amongst others. The Apollo range includes many spiral conveyor solutions including various infeed/outfeed configurations and multi-lane systems. The conveyors are also quiet, require little maintenance and occupy only a small footprint. JMP Australia welcome this relationship with Apollo with the spiral conveyors and other vertical conveyor solutions complementing JMP’s range of products. Apollo’s products are available as stand-alone units or integrated as a part of a complete JMP system. JMP provide service and support from Melbourne, Sydney, Brisbane and Auckland. The geographical distribution and depth of technical services provided by JMP in these locations underpins this agreement.